A native San Franciscan, Nicci studied at the American Conservatory Theatre (ACT), City College of San Francisco and San Francisco State University. Voice teachers have included Alix Korey, Kathryn DeHaven and the late, great Cantor Israel Reich. Nicci's theatrical credits have included Cuba Si at ACT. 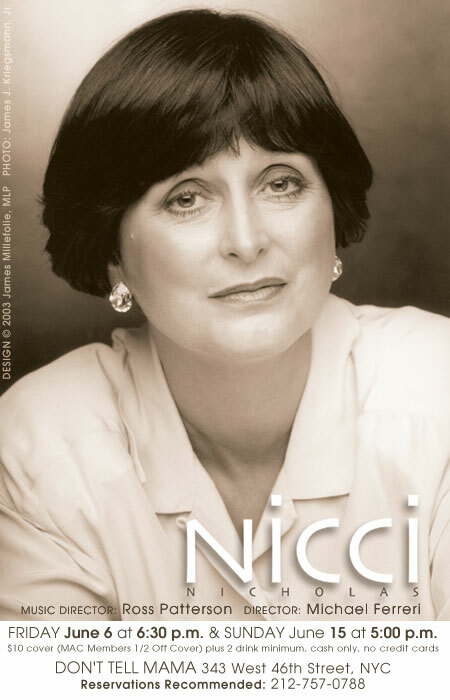 Nicci has sung at benefits alongside Sally Struthers, Baby Jane Dexter, Andrea McArdle, Eileen Fulton and Florence Lacey. A New York City open mike cabaret scene favorite, Nicci has performed on the stages of Rose's Turn, Eighty Eight's, Brandy's, Pegasus, Steve McGraw's, and Don't Tell Mama.